On September 6, 1620 the Mayflower set sail from England to America crossing the Atlantic Ocean with 102 passengers onboard. Of the 102 passengers, 41 of them were true Pilgrims, meaning they were religious separatists seeking freedom from the Church of England. The Pilgrims called the common folks traveling with them who had remained part of the Church of England, “strangers.” The Pilgrims were seeking the right to worship as they wished when they signed a contract with the Virginia Company, a trading company chartered by King James I, allowing them to settle in northern Virginia. Due to dangerous shoals and a near shipwreck, the Mayflower did not make it to Virginia. Instead, they landed in Massachusetts. Landing outside the Virginia Company’s territory created a conflict among the Mayflower’s passengers since the non-Pilgrims, or “strangers,” felt the contract with the Virginia Company was void. The Pilgrims wanted to reduce tension before a rebellion took hold, allowing them to establish a New World colony, and preventing the group from separating in their new, unfamiliar environment. The Mayflower Compact was created as a temporary set of laws for ruling themselves as per majority agreement. In short, the agreement established that the colonists would remain loyal subjects to King James, live in accordance with the Christian faith, work together to create one society, and create laws for the good of the colony. 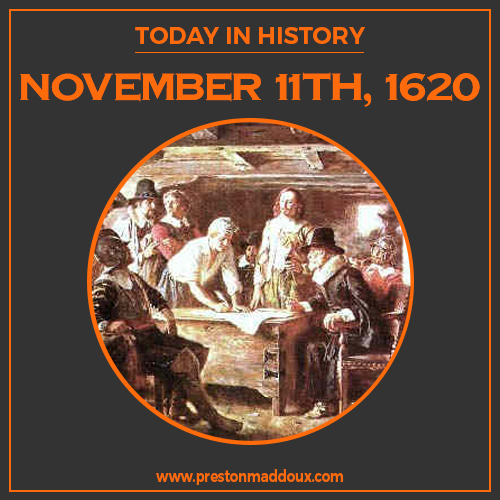 This agreement, later named the Mayflower Compact, was signed by 41 colonists on November 11th, 1620. PM LAW | Preston Maddoux LLC is a local law firm in Clackamas, Oregon serving as your Business Lawyer, Employment Attorney, Construction and Real Estate Lawyer, or who can assist with Litigation, or with your Will, Trust or Probate. Call PM Law | Preston Maddoux LLC at (503) 666-7114 Today!